In the distant future, humanity finally learns from its mistakes. All wars on the Earth are buried in the past. 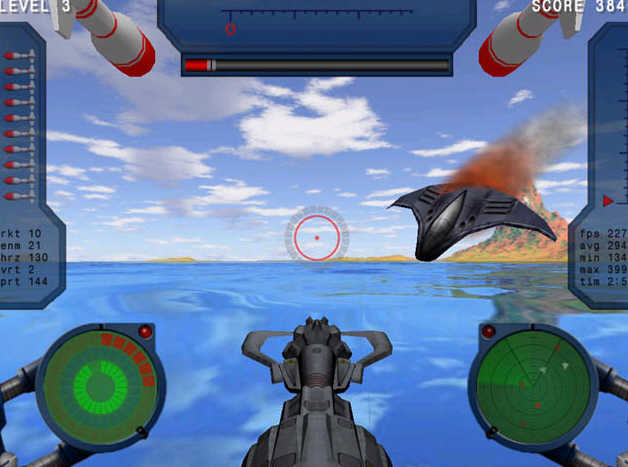 SILENT ATTACK - The Near Danger Zone is an action game that will keep your nerves strained, constantly firing adrenaline into your blood. You will have to cope with a difficult task - you must protect your "energium" quarry against the enemy's cyborg-piloted planes as long as you can. You can use only one thing against your enemy - a powerful plasma gun that can destroy the enemy's plane with one shot. It is not an easy task, even for such an experienced gunner as you will soon become! The attacking machines learn, changing their tactics and technical characteristics. Your only weapons are your personal fighting qualities: the ability to stay calm, stay focused, and react quickly. Step by step you will be polishing your combat skills, gaining valuable experience and turning powerful steel machines into clouds of helpless elementary particles. Game and screensaver all in one package. Battle Packman (Colobky) - Enjoy the REAL 3D scene and professionally animated characters in this Pacman like arcade game. Beetle Ju - Arcade earth-digging, stone-falling Beetle Ju game like Boulder Dash, Digger or Supaplex game. WildSnake Arcade: INVASION WAVES - No more bricks, no more breaks! Take the challenge! Experience real battle! Burn PS2 Game - Game Cloner - GAME CLONER helps you to burn PS2 games, Burn DVD Games or TV Games, whatever they are! Speed Gear - can be used to adjust your Windows operation system speed. Bubble Bobble: the New Adventures - It is a remake of a popular classic game "Bubble Bobble". Bubble Bobble Quest - A brand new remake of the popular classic game "Bubble Bobble" ! Tamale Loco - Rumble in the Desert 2 for Windows is a super game for you, download tamale loco now !